I hardly need to write about John Calow as the obituary for this ancestor is a dream in detail. John Calow is my GGG Grandfather and seems truly to be an ancestor to be proud of. Census returns show scant detail of his life in comparison to his obituary. So what information do the censuses give? In 1841 John Calow appears to be working as a manservant at Beauchief Hall although I do not have absolute proof that it is him it seems very likely. At the same time his wife to be Mary/Jane Hopkinson was working as a servant also, for the Arkwright family, maybe that is how the couple met. By 1851 John is living in Clowne (his birthplace) with Jane his wife, two year old George and baby Sarah Ann, his occupation is given as Agricultural Labourer. In 1861 the family have moved to the town of Calow and are living in the interestingly named Nether Cockally, Elizabeth, Eliza, Hannah and Mary have been added to the family. John’s occupation is now local Methodist preacher and miner. 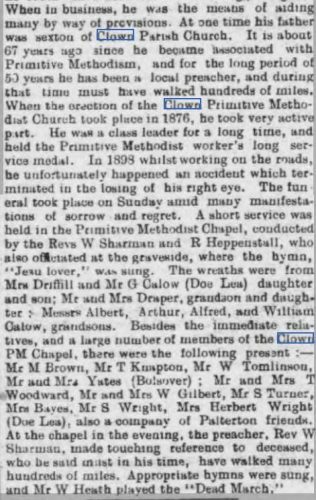 1871 finds the family moved again, this time to Sheffield, with son George working as a stoker, Elizabeth is joined by her husband and cousin William Calow and Sarah Ann by her husband William Reddish, both Williams are miners. Also living with the family as a boarder is a Richard Reddish an assistant clerk. 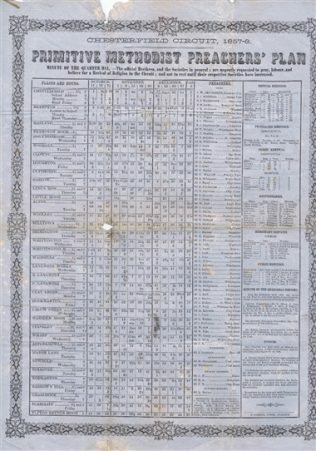 John is still listed as a miner and preacher. In 1881 John and Jane are back at 8 North Road, Clowne this time living with Granddaughter Emma Reddish and visiting preacher Amos Theobald. 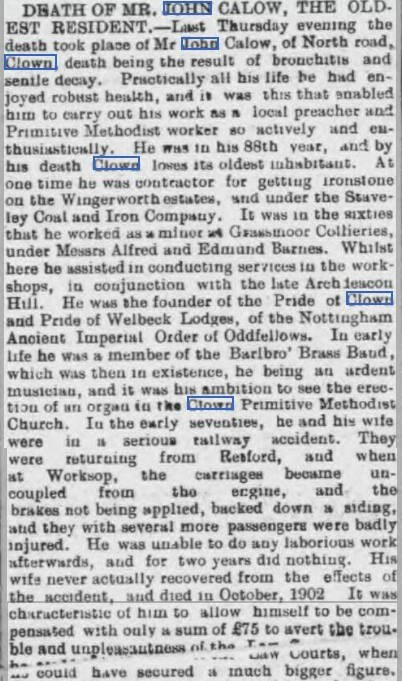 In 1891 living at 152 North Road, Clowne, John is described as a general labourer (maybe the preaching didn’t impress the census taker), Granddaughter Emma is still with them, plus three lodgers, Charles Brown, George Calow (can’t work out if he is related) and James Ellis. The final census we find John in is in 1901, living at 85 North Road, Clowne still with wife and Granddaughter Emma plus three male lodgers. I guess that Emma must have cared for her grandparents and presumably cooked for the lodgers, by this stage according to the obituaries Mary/Jane had dementia and John had lost an eye, he also suffered from dementia at the end of his life. So what extra information does the obituary tell us about John? Died from Bronchitis and senile decay. Clowne’s oldest resident, in his 88th year. Contractor for getting ironstone on the Wingerworth estates. Enjoyed robust health which helped him work as a local preacher and Primitive Methodist worker. Worked as a miner at Grassmoor Collieries. 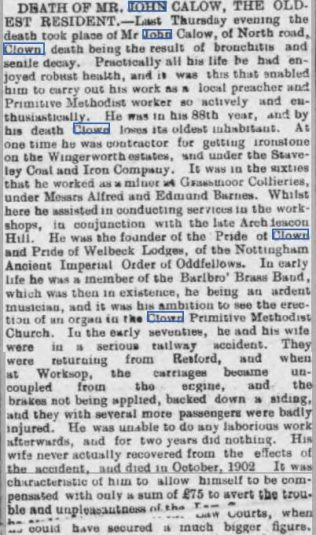 He was a member of Barlborough Brass Band. He was in a serious railway accident from which his wife never really recovered, he couldn’t work for two years. He only took £75 in compensation. He was a Methodist Local Preacher for 50 years and walked many miles during this time. “When in business he was the means of aiding many by way of provisions”. – think this means he was generous. His father was sexton at Clowne Church. He packed a lot into his 88 years, I wonder what would he have made of himself given modern day education and opportunities. 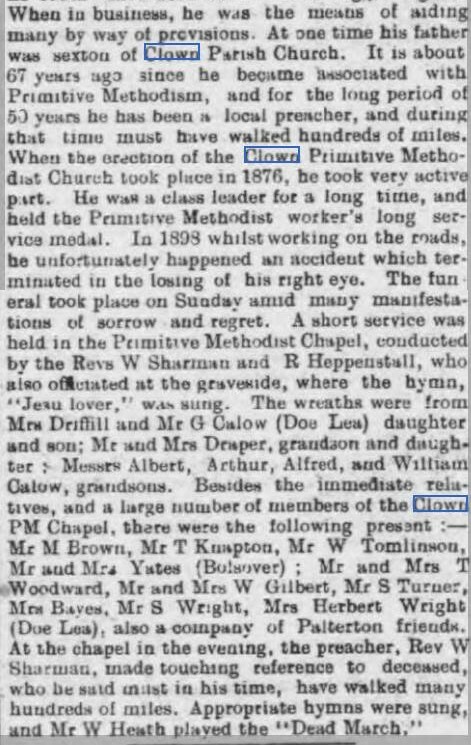 I would also like to know who wrote the obituary, it certainly gives the impression that the writer knew John Calow personally and liked him, or maybe they simply spoke to someone who did. Whoever it was, I am grateful to them for giving me such a detailed insight into the life and character of this fascinating ancestor.